Manage your hectic weekdays with this spicy-sweet dish that's done in less than 20 minutes. Manage your hectic weekdays with a 20-minute dinner the whole family will love. 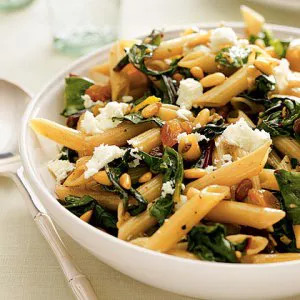 This low-cholesterol dish combines whole-wheat penne pasta with vitamin K-packed Swiss chard. The mixture of golden raisins, jalapeño, and pine nuts adds a surprising (and delicious) spice, sweetness, and crunch. Don’t like the feta cheese? We think goat cheese would be yummy, too! This dinner clocks in at just over 400 calories per serving. Plus, you’ll get 37 percent of your recommended daily protein intake and a solid 7 grams of fiber.